Ultimate Preakness Betting Guide. 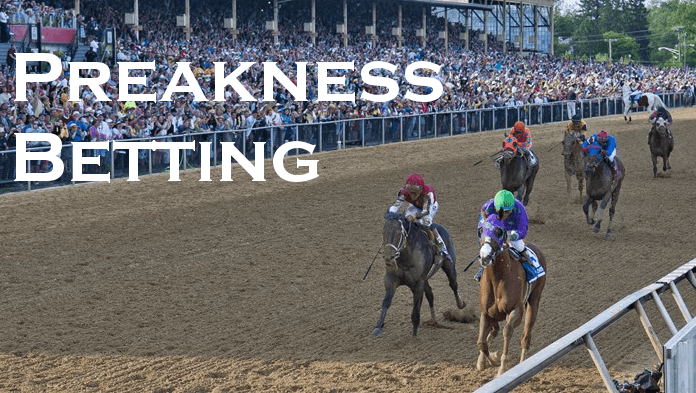 Learn how to bet on the Preakness Stakes. See last year’s video and hear the greatest Preakness call ever. Learn simple Preakness bets. Read about the Preakness Stakes’ biggest long-shot wins. Keep scrolling. The Preakness is always 2 weeks after the Kentucky Derby on the third Saturday in May. Profit from these Preakness Betting options. Pick both the Black-Eyed Susan and Preakness Stakes winners. Make your picks before the Black Eyed Susan Stakes begins. Post time is 4:48 PM the Friday before Preakness Day. The 1 1/8 mile Black-Eyed Susan is for 3-year-old fillies. This Grade 2 race has a $250,000 purse. It is one of the distaff counterparts to the Triple Crown race series. Hopefuls must win the Kentucky Oaks, Black-Eyed Susan and Acorn Stakes. Race books determine Black-Eyed Susan and Preakness Daily Double payouts from each horse’s odds of winning its respective event. Review the Black-Eyed Susan Preakness will-pays after the Black-Eyed Susan has concluded. Payouts include the Black-Eyed Susan winner paired with each Preakness horse. Odds may change up until Preakness post time. Review each horse’s most recent race results. Include Kentucky Oaks and Derby performances if applicable. Horses will not compete between the Derby and Preakness races. Select horses to key into the first, second and third position. Each key contains one or more horses. Final order does matter. The 10 horse Preakness field is much smaller than the 20 horse Kentucky Derby. Each key should have 4 or less horses. Select horses most likely to finish in the top 3. Also include a couple less probable horses. Occasionally a longshot will finish third. Horses A & B in the first position. 2 horses from 1st key + Horse C in second position. Total unique Horses: 4 (A,B,C & D). Each combination costs $1. Total cost is $8 for 8 combinations. Note: Trifecta wheel costs will vary depending on the number of unique horses. Using the same horse in multiple keys decreases cost. Adding new horses to each key increases cost. Trifecta Part Wheels cost less than a Trifecta Box. They are also more efficient. You will bet less to potentially win more money. 3. Preakness Win Place Show Bet. Also called “Across the Board”. Pick a likely top 3 finisher. Place $2 Win, Place and Show bets on this horse. $2 x 3 bets. The entire bet costs $6 total. Ask your track teller for $2 “Across the Board”. Or select this wager from your online race book. Race results determine your payout. There are 4 distinct outcomes. The following lists payouts from highest to lowest. All Win-Place-Show bets lose if horse finishes fourth or worse. Also called “out of the money”. Pick from the top 6-8 contenders. Don’t bet longshot horses unless you’re extremely confident. Avoid placing multiple Win-Place-Show bets. Consider a Trifecta or Superfecta box bet instead. The 10 horse Preakness field makes picking a winner much easier than the Derby. Bettors should avoid less efficient wagers whenever possible. Play 2 horses at once with the Exacta Bet. Pick 2 horses. One must finish first. The other must finish second. Final order does matter. Your bet wins if the horses finish first and second in the order you specified. Bet loses if one or none of your selections finish top two. Bet also loses if your selections finish in the wrong order. The Exacta bet minimum is $2. The maximum is commonly $500. Bet the track minimum. Place no more than 3 Exacta bets on different horses. One winning exacta justifies a $6 expense on 3 separate $2 bets. You could profit substantially. Your horse doesn’t have to win to turn a profit. The show bet rewards bettors for making a good-enough prediction. It manages risk like the Quinella Box. But it costs less and pays out more. Visit your online race book. Minimum bet is usually $2. The show bet wins if your horse finishes first, second or third. Also called “in the money”. Payouts are smaller than successful win or place bets. Show bets on longshots pay the most. Show bets on favorites or “odds on” horses pay the least. Consider placing Show bets on multiple horses. Don’t hang your hat on one selection. Diversify your investment. You’ll increase the likelihood of profiting. Deposit early Preakness week. Consider using Bitcoin or other cryptocurrencies. You’ll avoid last minute credit card processing glitches. Monitor Preakness Betting odds carefully. Visit your online race book’s odds page regularly. Odds will change up until post time. Shop Preakness betting odds at multiple sportsbooks. Novice bettors stick to simple +EV horse bets. Research and bet longshots carefully. Leave trifectas and superfectas to expert handicappers. Most discounted Oxbow’s chances of winning the Preakness despite a respectable 6th place at the 2013 Kentucky Derby. His front running style wasn’t conducive to races requiring big finishes. That meant jockey Gary Stevens would need to work closely with him the week before the Preakness. The extra practice allowed Stevens to get to know Oxbow. Their diligence paid off. Oxbow moved to the front after a bumpy Preakness start. Stevens guided him about 1 ½ lengths ahead. Then Stevens relaxed the pace. This strategy allowed Oxbow to save much-needed energy for the finish. Coming off the final turn, Oxbow surged for home. His lead opened to 3 lengths. Seconds later he won the Preakness, never challenged from any other horse. Stevens later called him the “most intelligent horse I have ever ridden.” It was Stevens’ 3rd Preakness win and trainer D. Wayne Lukas’ 6th. Oxbow later finished second at the 2013 Belmont Stakes. Master Derby’s Preakness win came in the middle of his career. He enjoyed modest success in 1974 as a 2 year old placing second in both the Breeders Futurity Stakes and Kentucky Jockey Club Stakes. Then he moved to longer races as a 3 year old. Wins at the 1975 Louisiana Derby Trials Stakes and Louisiana Derby showed Master Derby had potential. He finished fourth at the 1975 Kentucky Derby with jockey Darrel McHargue. Master Derby went on to win the 1975 Preakness at 23 to 1 odds. He soundly defeated Kentucky Derby winner and heavy favorite Foolish Pleaseure. It was one of the biggest upsets in Preakness history. Master Derby and McHargue finished 3rd at the 1975 Belmont Stakes. As a 4 year old he won 3 races and placed second in the 1976 Metropolitan Handicap. Deputed Testamony didn’t run the 1983 Kentucky Derby. Instead he won the Keystone Stakes at Keystone Racetrack. Then the Federico Tesio stakes at Pimlico. He must have loved Pimlico Race Course. Returning to run the 1983 Preakness, Deputed Testamony was nearly ignored at 15 to 1 odds. But his race performance proved otherwise. He defeated Kentucky Derby winner and heavy favorite Sunny’s Halo. His luck ran out the Belmont Stakes finishing sixth to Caveat. Deputed Testamony’s next major win as a 3 year old came at the Grade 1 Haskell Invitational Handicap. He found the magic once again as a 4 year old at Pimlico. Deputed Testamony cruised to a win in the Baltimore Handicap. He set a track record at the 1 1/16 mile distance while suffering a career-ending injury, subsequently retiring to stud. The Deputed Testamony stakes was named in his honor. It is held annually at Laurel Park Racecourse in Laurel, MD. Bee Bee Bee never ran the Kentucky Derby. Trainer Del Carroll decided to run him at Pimlico’s 1972 Survivor Stakes instead. A commanding 7 length victory convinced Carroll to enter the Preakness. Jockey Eldon Nelson would ride him. 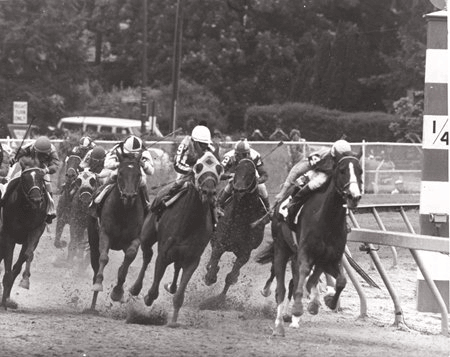 Track conditions were sloppy at the 1972 Preakness Stakes. It had rained the night before. Kentucky Derby winner Riva Ridge was the heavy favorite with Key to the Mint and No Le Hace likely contenders. But Bee Bee Bee wasn’t fazed. He surged ahead early and never looked back, holding off a late charge from No Le Hace. Riva Ridge’s Triple Crown dreams were dashed. His Preakness loss was particularly agonizing when he won the Belmont Stakes weeks later. Bee Bee Bee didn’t run again until the 1972 Patriot Stakes at Pennsylvania’s Liberty Bell Park. He won again and was subsequently retired to stud in 1974. Shackleford started his 3 year old season in 2011. Initially his racing prowess went all but unnoticed. He won his first start with a strong finish at Gulfstream Park in February 2011. But the April 2011 Grade 1 Florida Derby changed minds. He had little to prove as a 60 to 1 longshot. Yet he led from the backstretch to the final turn at a blistering pace. Shackleford nearly won the race, losing by a head after a late surge from Dialed In. Encouraged, Romans took Shackleford to the Kentucky Derby where he finished 4th to Animal Kingdom. Then they re-matched at the 2011 Preakness. This time Shackleford accelerated down the homestretch, holding off a late charge from Animal Kingdom. He won by half a length. Shackleford was 5th at the 2011 Belmont Stakes. He finished second by a head at the July 2011 Haskell Invitational. Subsequent racing attempts were mixed but respectable, including second at the Indiana Derby. Eventually Shackleford was nominated for the Eclipse Award. He lost to Animal Kingdom. In the final race of his career as a four-year-old, Shackleford won the 2012 Clark Handicap at Churchill Downs. He later retired to stud.